In 1998 Michael Fielder Architects Pty Ltd designed a serene public space to link the 1867 Woods MacKillop Schoolhouse, the 1872 Convent and the 1926 St Joseph’s Church with the new Interpretive Centre. The Mary MacKillop Shrine was positioned at the northern end of St Joseph’s Church so that it participates in this public space. Its construction, using glass shingles fixed with pins and silicone, reflects that of the heritage houses in Petticoat Lane with their timber rafters and battens supporting timber shingles. The blue glass is reminiscent of the blue embroidery on the habit of the Sisters of Saint Joseph. The siting of the Interpretive Centre allows the Church, Shrine and Schoolhouse to maintain their strong presence, and the covered walk strongly links them all. 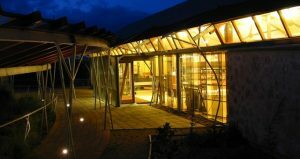 It is a simple curved structure, with solid timber rafters draped with copper straps fixed in a diagonal pattern. The Interpretive Centre is a linear building within a gabled roof echoing the forms of the Schoolhouse and Church roofs. The palette of materials is simple, with finishes relating to materials of the Schoolhouse. The gabled roof is tied together with a steel tying mechanism, which has characteristics similar to the Schoolhouse timber. Sections of ply ceilings and the rubble stone walling in the Exhibition areas provide an historic link with the timber and stone used in the Schoolhouse. Externally, the materials are glass, with a beige render to the solid walls, with some custom orb curved walling and mini orb spandrel panels. 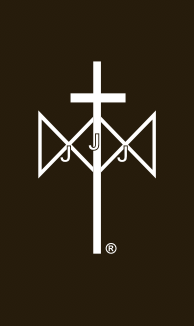 A tensioned fabric structure to protect the western facing windows is constructed using a rich chocolate brown fabric which complements the copper covered pergola and reflects the traditional habit of the Sisters of Saint Joseph. Views from within the Interpretive Centre to the existing Church, old Convent, old Schoolhouse and new Shrine are available along the length of the building. The limestone coloured, concrete paved forecourt provides an expansive area for churchgoers and visitors. A garden incorporating native species collected by Father Woods is located on the eastern side of the Church. The sculptured gardens, retaining existing rose bushes, feature along Portland Street with the central focus being the Reflective Pool, which adds stillness and peace to this special site.